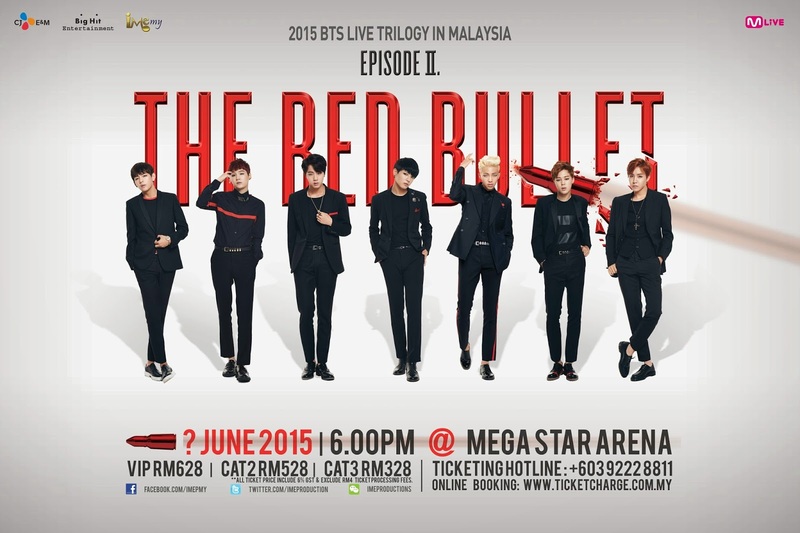 IME Productions is the lead promoter of 2015 BTS LIVE TRILOGY IN MALAYSIA “EPISODE II. THE RED BULLET”. The show will drop on June 2015, 6PM at Mega Star Arena, KL. Before IME announce the concert date, we are holding the “GUESS THE CONCERT DATE” concert and it’s open to all ARMYs to participate! Leave your message on IME Productions Malaysia Facebook page and write your comment below contest box. The grand prize will be official bomb light stick + autograph poster, consolation prize : BTS autograph poster. Contest due date for contest: 10 April 2015. Ticket launch will be held on April 12 (Sunday) at KWC Fashion Mall, LG centre court stage area from 11AM till 3PM. First 1000 purchasers come together with an exclusive giant concert poster, first come first serve. VIP ticket purchasers will be entitled to participate in a lucky draw to win an exclusive BTS “Hello Session" passes. Details of the "Hello Session" event will be posted on a later date. 1 person can purchase up to 8 tickets during ticket launch day. For those people who can’t make it to the ticket launch, they can purchase ticket via TicketCharge (www.ticketcharge.com.my) starting from April 12 (Sunday) at 3PM. Ticket outlet sales will begin on April 13 (Monday), please visit to TicketCharge office, Speedy music store, Rock Corner music store, Victoria music center, Neway Karaoke outlet and Celcom blue cube outlet or may call TicketCharge hotline (603)92228811 or IME Productions hotline at (603)21666166 for ticket purchase. For further information, please log on to IME Productions official Facebook page (www.facebook.com/imepmy).